It’s Labor Day! Anarchy anyone? Whilst it seems that everyone in the UK has been shivering away, we’ve been basking in glorious sunshine with the unfortunate addition of being bitten by various beasties. We’re really part of the team now here at the Quaker Intentional Village – Canaan. Our contribution is clearly valued, and we’re finding ways to offer our skills, as well as our energy and enthusiasm. This week has seen a nice pattern of gardening, spontaneously shared meals and interesting discussion emerging. The beauty of the area continues to amaze us. Adrian has discovered a local pond owned by friends of the community, a beautiful swimming location. Our first Labor Day weekend (the American equivalent of May Day, but no socialism allowed!) has been dominated by some pretty diverse cultural events. We went to the Columbia County Fair, a big mouthful of Americana dripping with fried food, fire trucks and firearms, plus a load of agricultural paraphernalia and information boards about soya bean production. Highlights include the duck racing, the biggest oxen I’ve ever seen, and most of all, the chance to hang out with Marcy, Lee and their kids. From there we crossed the state border into Massachusetts to see Josh Groban at Tanglewood (thanks Sandy!). I’m ambivalent about Josh’s crooning, but the chance to see the iconic music venue was too good to pass up, and I wasn’t disappointed. Lying on the lawn, the stars coming out to the strains of Sondheim’s ‘Children Will Listen’, was magic. The next day we had the mini-est of road trips to Kinhaven, a music camp in Vermont. Our friend Josie, who originally told us about QIV-C, attends a residential event called ‘House Party’ every year. It’s a week of orchestral and chamber music, and membership is by invitation only. We arrived early, walking in during lunch. Within seconds we were handed a plate of food, and heard emotional tributes to a long-standing member, who recently died before her 105th birthday. I turned to Adrian saying ‘this feels like church!’ Both in the dining room and at the concert that afternoon, it was clear that this was a special and love-filled occasion. That evening I was able to join in with some informal chamber music, my viola shoulder rest having travelled across the Atlantic with me. From the sublime (Mozart’s horn quartet) to the ridiculous (a Brunetti bassoon quartet), it was a privilege to join the music making. 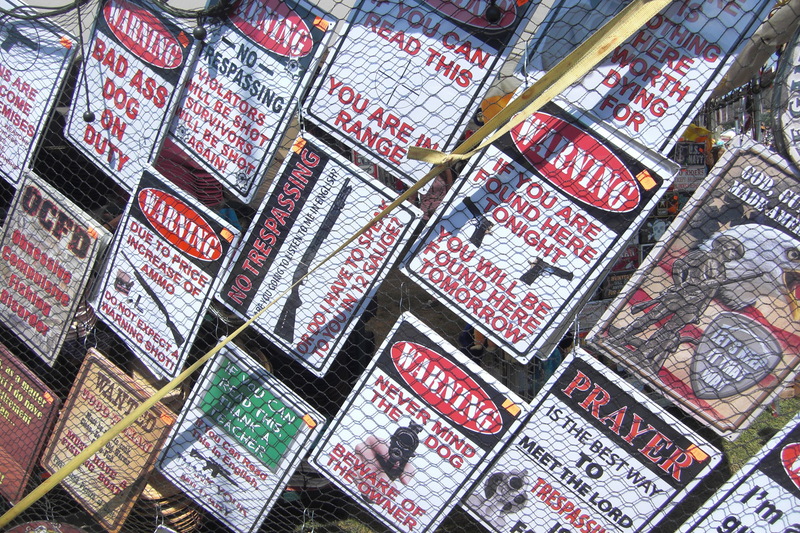 Signs on sale at the County Fair. Is this the freedom capitalist individualism offers? Hear the word ‘anarchy’ and most people think chaos and young people in balaclavas smashing shop windows. This is not what I mean. Anarchism is a political tradition that encompasses a number of theories. Colin Ward, in his ‘Anarchism: A Very Short Introduction’, suggests that these theories hold in common ‘rejection of external authority, whether that of the state, the employer, or the hierarchies of administration and of established institutions like the school and the church’. You may still think this equals chaos and smashing things, but I disagree. Could ‘The Lord’s prayer’, the famous prayer of Jesus’, be a call to Christo-Anarchism? My childhood memory of this prayer suggests not. I was chastised by my cub-scout leader (definitely an example of external authority) because I couldn’t recite it like the other boys. The fact that I didn’t go to church didn’t seem to matter. Putting these memories of institutional coercion aside, I believe there is something very subversive about this prayer. God is acknowledged as parent and creator, and God’s kingdom is yearned for. When Jesus prayed this prayer, there was already a king – Caesar. In Rome, Caesar was considered a God, and Father of the nation. He was addressed as Lord/Master, Our Lord, King of Kings and Son of God. To hear these titles now, we might think of church hymns like the ones I had to sing as a cub-scout, understanding very little of what was going on and bored with the whole affair. To 21st century ears, they’ve lost their radical impact. We need to understand that to say that Jesus is Lord is to say that Caesar (or the Empire, or the state, or the Rule of Law) isn’t. To claim Jesus as Son of God is a political statement. 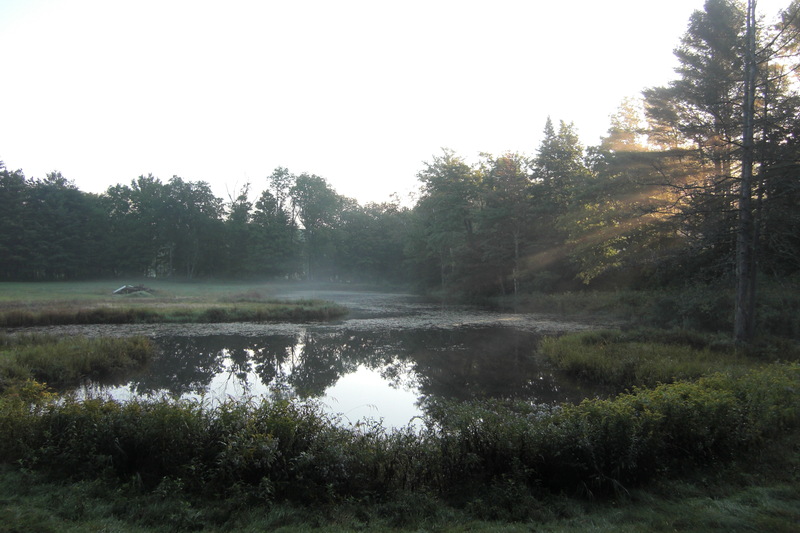 Early morning at Kinhaven music camp, Vermont. To me, Quakers and Anarchism seems a good and logical combination. As Quakers we trust the Spirit to guide us. We hold that we need no mediators to commune with God, so why place our faith in the state and the Empire it supports? Van Steenwyk writes ‘The Quakers are internally organize along anarchist lines. All decisions are made locally and by consensus (which has had a tremendous influence on modern anarchist decision making) and are largely egalitarian. While Quakers don’t usually bring this approach into an anarchist political theory, Quaker approaches to power and violence has led to significant cross-pollination between Christian anarchists and Quakers.’ I’ve only just discovered Anarchism as a political and religious idea. My thoughts are founded on the lightest of reading around the subject, but it’s enough to make me think this is a very worthwhile line to pursue. Quakers – are we a bunch of reluctant, closeted anarchists? Answers on a postcard please. Huge, gliding monarch butterflies – they migrate to Mexico!